← Lemons, Lemons, Lemons !! Sometimes I want to make something very quick and simple; and there is nothing easier than popping a chicken in the oven to roast (I usually cover it in herbs) and serving it with some sweet potato chips and whatever vegetable I have to hand. 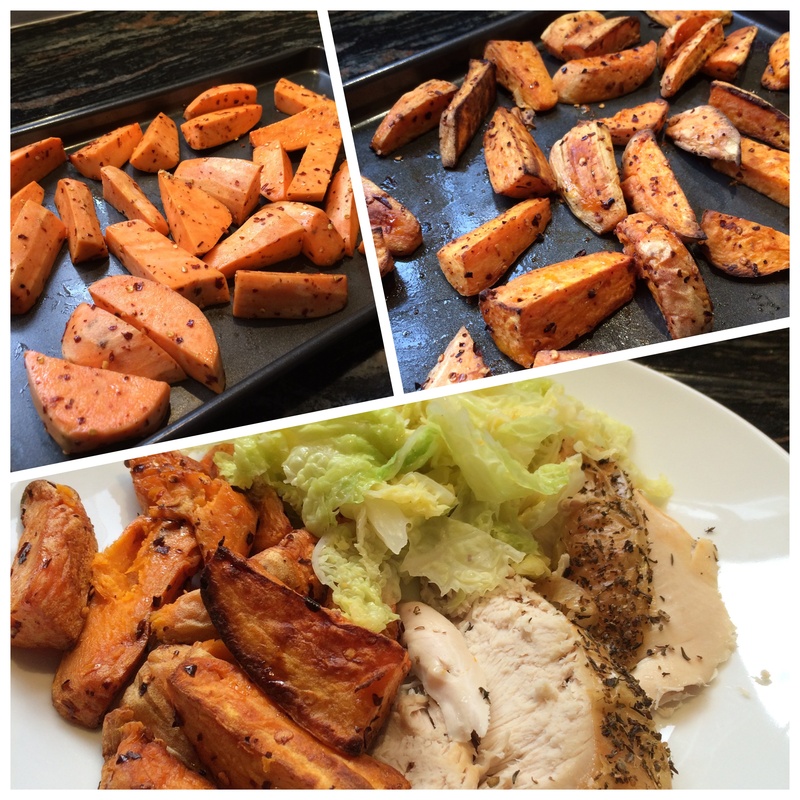 As chicken can be fairly bland, I love adding chilli flakes to my sweet potato chips to give the dish some ‘oomph’. Peel some sweet potatoes and slice into chunky chips and place into a bowl. Drizzle with olive oil and toss. Add some crushed chilli flakes and toss again then tip the chips onto a baking sheet. Bake at 175° for about 45 minutes until the edges are nicely and browned and the chips cooked through. I served these chips with some roasted chicken and lightly steamed buttery cabbage which I had sprinkled with pink sea salt, and they completely transformed the dish. One of the reasons I like roasting a whole chicken is to have a small bowl of left-over pieces of meat for the next day; doesn’t really matter how much or how little is left – there is always a recipe to use it up. Try my Spicy Chicken Wraps which I serve with a lovely raw carrot slaw, and I substituted left-over chicken for bacon in Grilled Corn and Quinoa Salad the other day and it worked so well. Another recipe using up left-over chicken is Sesame Chicken Salad with Cucumber Noodles. This entry was posted in Dinner, Vegetables and tagged Chicken, Chilli, Dinner, Healthy Eating, Lunch, Sweet Potato. Bookmark the permalink.